The government released Thursday that the suicide rate among middle-aged Americans has climbed by an astounding 28 percent in a decade. 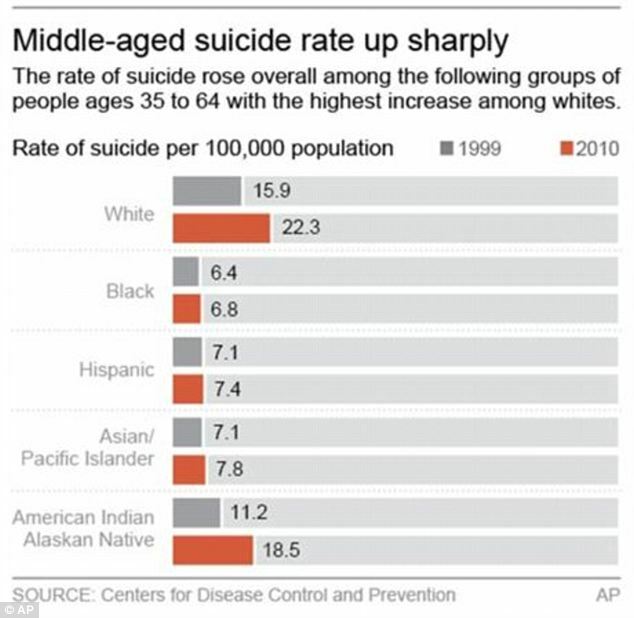 The suicide rate for white men and women in that age group has climbed even more — the rate jumping 40 percent between 1999 and 2010. 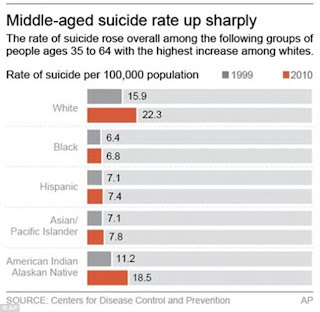 Suicide has gone from the eighth leading cause of death among middle-aged Americas to the fourth. The Washington Post reports that the recession, which hit manufacturing-heavy states like Michigan pretty hard, may have pushed already troubled people over the brink. After all, losing a job or getting a pay cut after working for years can have an extreme effect on your self-worth. But it seems like, although suicides among people ages 35 to 64 accounts for about 57 percent of suicides in the U.S. — suicide prevention efforts focus mostly on youth. While there are several challenges youth have to deal with — such as bullying, stresses of fitting in, etc. — many times the mid-life challenges are overlooked. After all, many people in this age group are so busy taking care of their teen's problems and making sure their children are cared for that their problems go by the wayside. But adulthood problems are just as real as teenage problems — and many times even more stressful. Some of the various problems plaguing the baby boomer generation are job loss, divorce, caring for aging parents, thinking about your own mortality, realizing life didn't turn out the way you expected (but does it ever turn out the way you expected?) and, an added stress for women — menopause. Sometimes, people go through a mid-life crisis. To me, I would say — go through that mid-life crisis! It's a lot healthier of a way to deal than to take your life. Dye your hair a weird color, splurge on a new sports car (if you can afford it), change your career, open your dream business, take a vacation. If this helps you feel better, then go for it. You only live once, and, instead of ending your life, live it! No, you're not too old to learn how to drive a motorcycle, dance in a mosh pit or dye your hair a bright fuchsia (even if this does embarrass your children). Most importantly, you need to learn that you cannot take care of others unless you first help yourself. Asking for help is not a sign a weaknesses. Instead, being able to admit that you do need help takes strength. And I'm hoping this newly released statistic will bring attention to the risks of suicide among the middle-age population and that, instead of just programs targeting teens, programs will be created for them as well. Don't think that what you're going through isn't important — because it is.